Hello, everyone! It's been a long while since I was made an editor of Study of Anime, and I feel like I've done nothing with it. So, as the cherry blossoms begin to bloom (yeah, real original analogy there, self), so, too, will this site bloom with new articles. This is a deconstruction of my Kamen Rider analysis panel, which looks at every Kamen Rider series, from W to Ex-aid, under a microscope. 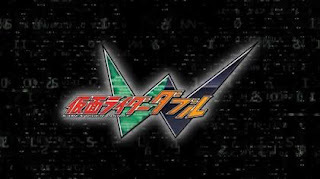 There will probably be more added to this as we go, but for now, here we go with Kamen Rider W.
Kamen Rider W (or, as it's pronounced, Double), aired from September 6, 2009 to August 29, 2010, and was the first series in what some call the "Neo-Heisei" era of Kamen Rider. The eras mainly refer to the era of Japanese history the series was made in; however, the fandom has started to refer to any series that was worked on by the series creator, Shotaro Ishinomori, as Showa era, and anything else as Heisei. Whichever it is, W was considered the start of a 'new' era, as the series preceding it (Kamen Rider Decade) was sort of the end of a decade of series. The series stars our main hero, Hidari Shotaro, who transforms into the "half-and-half Rider", along with his partner, Philip. Right away, the series screams "film noire" at the top of its lungs. Shotaro himself is a detective, who wears a suit, a trilby hat, and drinks coffee (we'll get to THAT little tidbit later). Film noire is a genre that tends to focus on crime films, with especially cynical worldviews. Shotaro himself identifies as a "hard-boiled" detective, which in his terms, means "Not being swayed no matter what the situation. It's a man-among-men lifestyle." However, the various characters throughout the series comment that he is half-boiled (yet another joke about the two-in-one Rider concept), and in the end, it is described as his greatest strength: a hard-boiled detective is not swayed, even for the best of reasons. Shotaro is often swayed by someone in need, and thus, is too compassionate to be truly hard-boiled. Bringing me to my next point is another aspect of Shotaro's character that he uses as proof that he is a hard-boiled detective - he drinks coffee. In America, that doesn't seem like much - Starbucks, Dunkin Donuts, and various other companies started here for a reason. In Japan, though, there's a trope with the cool, "lone wolf" type character. They tend to drink coffee, properly brewed either by a drip brewer or a French press. My theory about this comes down to time. Canned coffee drinks are very popular throughout Japanese vending machines, but it's rare that we see anyone sitting down to drink a proper cup of coffee. Thus, it is used for the calm and collected characters, who have the time to sit and wait for a cup to be brewed. Kamen Rider W is one of the most well-loved Kamen Rider series to this day, for good reason. It established many of the tropes that we'll see throughout the rest of the Neo-Heisei era, and its theming creates a world with interesting characters, with plenty of motives to keep the viewer guessing. If I had to recommend somewhere to start, it would be one of my first choices.